Ilkeston FC and player-coach Luke Foster have parted company by mutual consent. Foster, 31, joined the Robins in the summer and featured frequently in the their defence until picking up an injury in the FA Trophy defeat to Barwell, which turned out to be his last appearance for the club. In a statement, the Robins claim that a re-structuring of the club is the primary reason for Foster’s departure. It reads: “The current format of a mixture of youth and senior players, with some training part-time, will take a back seat for now and the club will go back to full-time training. The club feels that at the present time, this is the best way forward for Ilkeston FC. “Everyone at Ilkeston would like to thank Luke for his contribution to the club, especially his work with the youngsters in the team. Foster subsequently signed for Ilkeston’s Evo-Stik Premier Division rivals Coalville Town on Wednesday. 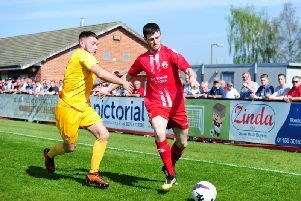 The move also leaves question marks over fellow senior players such as Anton Brown and Rory Coleman, neither of whom have featured in the Robins’ last three games. Ilkeston are due to host Grantham Town on Saturday before the visit of Matlock Town in the Derbyshire Senior Cup next Tuesday night.